4th of July Cake recipe with cream cheese frosting inside is a fun and festive dessert to make with your family. A fun 4th of July Cake should be required all all Independence Day celebrations. This red white and blue cake is colorful, and ready to party. 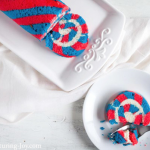 This dessert is so fun, and perfect for any patriotic gathering. 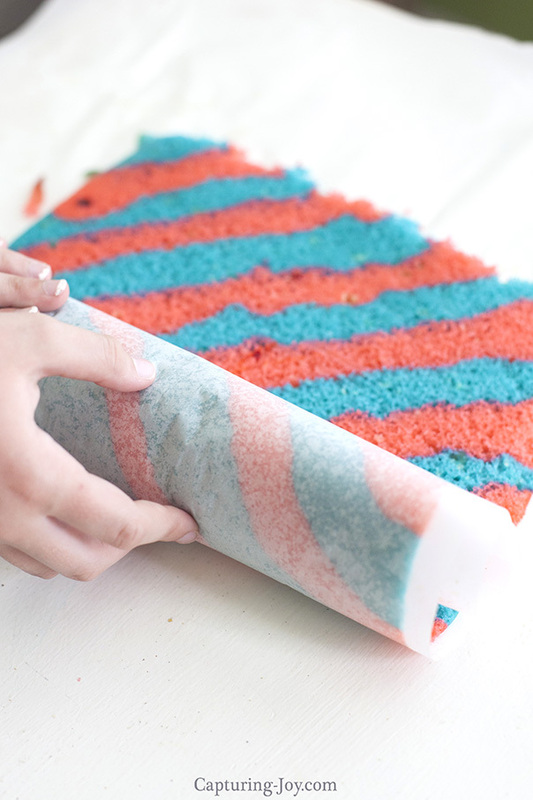 Making this red white and blue cake takes a bit of time, but it is worth it! 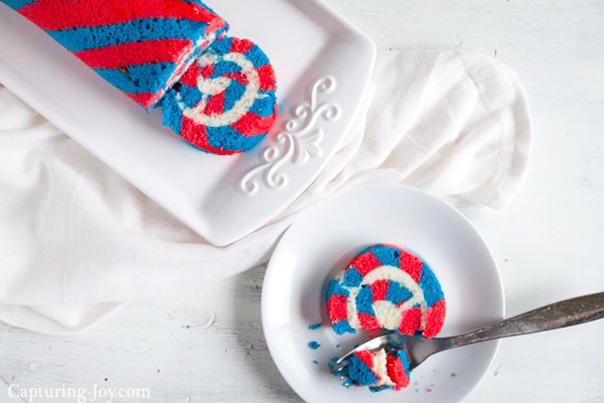 Not only is it delicious, everyone loves the fun patriotic dessert. I was first introduced to the cake roll years ago when I had my first pumpkin roll. They are my FAVORITE fall treat. 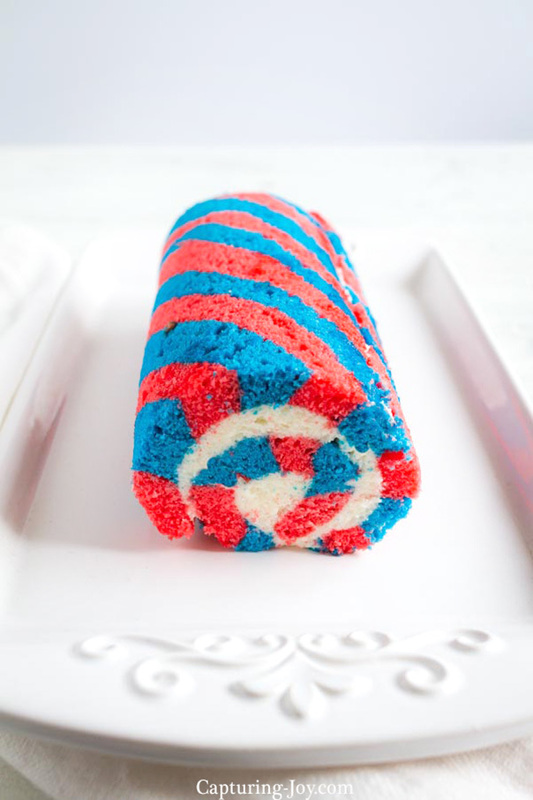 Just like that dessert, this 4th of July cake has a delicious cream cheese filling in the center. The outside cake is a doctored up boxed cake mix, but in fun patriotic colors: red, white, and blue! 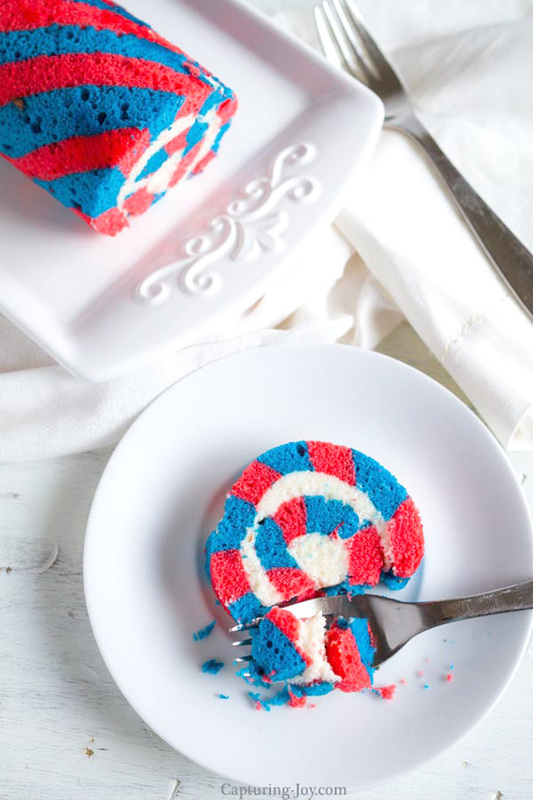 This fun red white and blue cake is the perfect patriotic dessert for your summer celebrations. In a large mixing bowl, combine cake mix, sugar and flour. Mix to combine. Add in water, eggs, vanilla extract, and yogurt to the dry ingredients and mix well using an mixer. Mix for approximately two minutes. Line bottom of two 10x15-inch jelly roll pans with parchment paper sprayed with baking spray. Divide batter equally among 2 bowls. Use red and blue color paste to each bowl of batter until you get a rich color. Paste will give a darker color than standard coloring. I like to use Wilton paste. Snip the tips off the bags and start layers of colored stripes at an angle across one pan. Alternate blue and red until complete. Continue until both pans are filled with stripes. Immediately flip cakes out of their pans, peel off the parchment paper, flip over onto a clean piece of parchment paper and immediately roll up the cake along with the parchment paper. Let it sit at room temperature for 10 minutes, then refrigerate for one hour or more until cool. Make the filling by beating cream cheese, powdered sugar, butter, and vanilla until well blended. When the cakes are cool, unroll carefully, peeling the parchment paper off as you go. Spread half of the frosting over top of each cake, then tightly re-roll. Refrigerate until ready to serve, cut into slices to serve. I always love a visual step by step instructions, so I took a few pictures for you when I made my 4th of July cake! After the cake bakes, pull off the first parchment and place it on a new parchment paper to cool, and roll it up. After it has cooled, spread the filling, and roll it up for good! I am excited to make this 4th of July Cake for our celebration this year! If you’d like other Patriotic and July 4th ideas, I’ve got a good handful on my site, including an American flag donut wall, learn patriotic songs like the Star Spangled Banner, tips to photograph fireworks, and free printable July 4th photo booth props!